We’ve added profiles to TES; this allows you to make connections with other teachers or members of the education community. We've added profiles to TES; this allows you to make connections with other teachers or members of the education community. How much information do I need to add to my profile? You can add as much or as little information to your profile as you feel comfortable with. But the more information you add the more useful the TES website becomes. For example, if you add details of your previous workplace to the 'My Workplace' section of profiles you can make connections with colleagues you used to work with. Alternatively, if you add a biography to your profile explaining your love of rock climbing you could also hook up with other teachers who like to climb mountains. To edit your profile, you need to login first. Once logged in, click on your user name appearing at the top of the page. From the options, select 'Profile' followed by 'edit'. How do I make profile information public/private? You can also make aspects of your profile private so they cannot be viewed by anybody else. To change the privacy status of your profile use the Display Option next to each section of your profile. You can choose an image to accompany your profile (we can handle gif and jpg files). This image will appear next to any resources you upload and any messages you post in the TES forums. You can either upload a photograph of yourself, or choose an image that represents you, or you could choose a graphic from our library. However you should make sure you have the appropriate permissions to use this image. You'll find the 'Add picture' option while editing your profile. Click on the 'Add picture' button and then click on 'Browse' to find a suitable image from your hard disk. How do I send a message to another TES user? What is the My TES page? 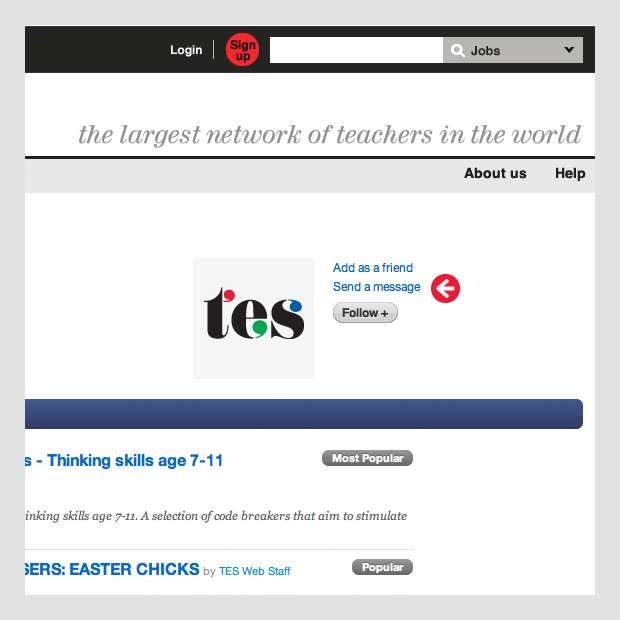 Every time you log on to TES, you'll find yourself at the My TES page. This page gives you a personalised view of TES content tailored to your subject preferences, which means you'll be presented with jobs, resources and forum discussions in your subject area. This is also the place to check out what your friends on the TES have been up to by clicking on the 'Friends' Activity' tab. My TES is your jump off point to TES content: you can edit your account details and profile, view your friends' list, carry out a job search and much more from this page. How do I reorder items on My TES? We've ordered the My TES page so that the Jobs box appears at the top of the page, but you can change the order if, for example, you want to have the Community block appear at the top of the page. To do this click on the 'Change order' link (shown below) and drag the items into the order that matches your needs.